There is nothing better at the holidays than a really good piece of peanut butter fudge. My mom would always make a peanut butter fudge at the holidays but it was more of a Chocolate Peanut Butter fudge because it was just melted Peanut Butter and creme drops candy. 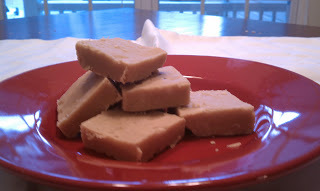 I loved this fudge and loved how easy it was to make! Microwave peanut butter and butter together for 2 minutes on high. Stir and microwave on high again for 2 more minutes. Add vanilla and powdered sugar to butter mixture and stir to combine with a wooden spoon. Pour into a buttered 8 by 8-inch pan lined with waxed paper. Place another piece of waxed paper on the surface of the fudge and place in fridge until cool. Cut into 1-inch pieces and store in an airtight container for up to a week.